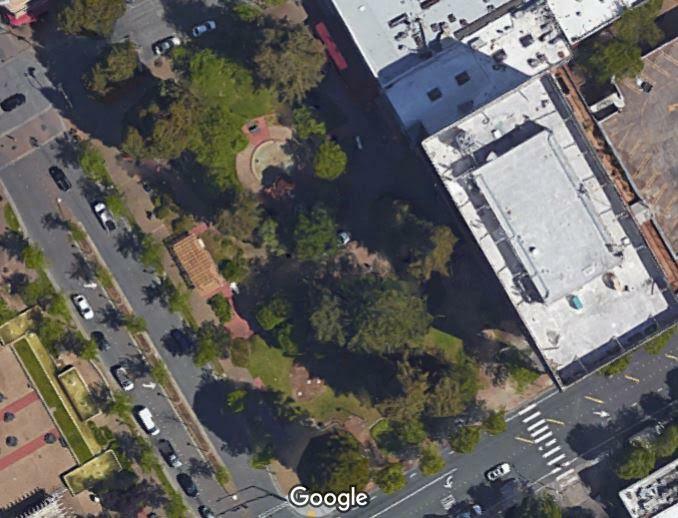 The recent removal of six 200-foot redwood trees for the Courthouse Square reunification project produced an unintended consequence that spotlights the concept, and the importance, of building performance in climate protection. The shade produced by the redwood trees, located in front of 50 Old Courthouse Square, significantly reduced the amount of heat, called solar gain, absorbed by the building. Now that the trees are gone, the building’s cooling system has to remove up to 1 million Btus of additional solar heat to keep offices comfortable during the day. Built in 1972, the building underwent a retrocommissioning in 2012, a 12-month process in which the heating/cooling systems were closely calibrated to actual outside conditions and monitored to lower energy use and operating costs, according to Jerry Hassel, Air Connection, Inc., who managed the project. After the retrocommissioning, 50 Old Courthouse Square ranked in the top 10 percent in Energy STAR’s Existing Building Program and significantly reduced its annual operating costs. “The trees played an important role in mitigating heat gain,” said Hassel, who noted that the building will be undergoing a second retrocommissioning in an attempt to restore its pre-tree-removal carbon footprint. The story of the redwood trees illustrates that each building is a dynamic system that is constantly working to balance outside and inside air temperatures, as well as heat absorbed from the sun, in order to deliver a comfortable indoor environment. This is known as building performance and is founded on the second law of thermodynamics, which states that heat naturally flows from warmer to cooler areas. How well the building performs is defined by how much energy it needs to maintain a comfortable environment. To perform well, a building needs: (1) an energy management system that includes monitoring energy use data, customizing equipment controls, and improving overall building efficiency across all seasons and (2) metered energy efficiency that enables actual onsite energy reduction to be precisely measured. Building performance is more than the sum of a structure’s efficiency measures; it is founded on long-term outcomes delivered by building science, ongoing data tracking and technological innovation — and the art of practical application over time. Since 2005 State policy has stated “energy efficiency is the least cost, most reliable, and most environmentally-sensitive resource, and minimizes our contribution to climate change.” Building performance, energy management, and metered energy efficiency are key strategies cited in recent California legislation, including Senate Bill 350 (demand-side energy management, efficiency metering), Assembly Bill 793 (incentives for energy management technology), and Assembly Bill 1103 (energy use benchmarking). In the fight to protect the climate, we need to use advances in digital/Wi-Fi technology, data science, heating/cooling equipment design, and applied building performance — and even the shade of a well-placed tree — to achieve deep, long-term, and reliable greenhouse gas reductions in our homes and businesses. Chris Cone is Principal of Chris Cone Consulting, specializing in pay-for-performance solutions that drive scalable efficiency investment, and founder of the Negawatt Market Project (www.negawattmarketproject.org), a research initiative exploring energy efficiency market models. Why did they cut the trees down? Do they plan on planting new ones? Kind of a long, drawn out way to state the obvious ,but useful to bring up the sharing/cooling issue. But what about solar gain in the winter, when you actually want it? I do have a more important question. How many poplar trees does it take to provide equal or better rates of sequestration as the mature redwoods that were removed? Is it possible to even get there? And if the poplar trees are shipped from China, the transportation carbon can be factored in. How many hundreds of years were the redwoods there to attain their height? Poplars are fast growing but they will not attain that great height. Some years ago I lived on that corner, 6th floor of the Rosenberg. How wonderful it was to look out the window in the green foliage and have the birds that close. It seemed magical. That should “shading/cooling”…….arghhh! Damn AUTOCORRECT! The project was stupid from the beginning. They cut mature redwoods but will plant new trees that will take 50 years to provide the carbon sequestration of those cut. They removed one street but added two more plus parking. More habitat for cars equals more traffic, noise, danger and pollination. The money should have been spent studying the feasibility of a streetcar line from Oakmont to Sebastopls via downtown and the SMART station. The businesses that supported this boondoggle just don’t get it. What they should want is customers not cars. The traffic, noise, ugliness and pollution caused by cars already discourage customers from spending more time downtown. Our city council Gave very little notice to the residence of the city of santa rosa on this. They depend solely on newspaper blips and those who may have signed up for council meeting notices to alert folks. Our city tax dollars were and still are being utilized by those with plenty of time on their hands to fight for more Down town parking closer to their store or business front despite all the underutilized parking garages. Why does this City Council make such ill-informed decisions?